Kansas Wheathearts: Happy Birthday Collin! It's birthday time around the Anderson residence and Chris and I have now been parents 10 years! WOW. We had a pizza party with Mom and Dad A, Bill and Paula, Phil and Denise, Morgan and Makenzie and of course our kiddo's. 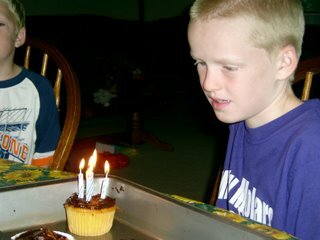 We had so much fun that Collin forgot to blow out the candles on his cupcakes. (unheard of). We did that the next day. We also had a party at school and I got to meet all his 4th grade friends. Thoughts on being a mom: What a journey this has been. When we got started with Collin, I thought I knew what I was doing. Ha! No pacifiers past 1 (try 3), sleeping through the night at 8 weeks (try 9 mths-Alan), off the bottle at 1 (2-1/2- Alan), potty training in a day (Ok this one we accomplished but only because they were 3 by the time dropped diapers). Of course they were going to be pleasant, well mannered, polite, energenic, desiring healthy food, sitting still at church, loving God and all that is good for them. I also said I would never force them to eat what they did not like (bad idea--they do not like anything sometimes). KS State Fair-- it's a wild ride! Big trucks and hunting...grunt grunt!